Here are some simple but important tips on how to use this powerful tool to cut through unwanted concrete. 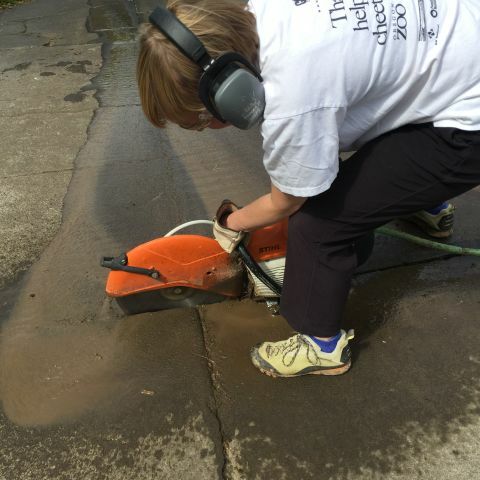 You can operate a concrete saw in one of two ways -- what we'll call "dry," which results in clouds of concrete dust while you cut -- or cutting with water, which results in a milky slurry that can make the workplace kind of mucky. Basically, gas-powered concrete saws have a hose fitting; you connect a standard garden hose, and water slows into the blade housing. You can cut "dry" -- the saw still is effective. But whenever you can, try to connect to a hose, because concrete dust is chock-full of unhealthy chemicals that you want to avoid if possible. And although the water can make the job messier, that's better than health problems associated with breathing concrete dust. So run water, just keep the flow low enough to keep the dust down. If there's a lot of water spraying out of the front and back of the saw as you cut, turn down the volume of water. If you do operate a concrete saw without water, at the minimum, wear a particle mask. A respirator mask is preferable. And, of course, eye, ear and hand protection are essential! Like a chain saw, concrete saws work most efficiently and safely when "pulling" toward you. So "push" the saw forward as little as possible. Concrete cut-off saws work best at high speed. You want to wear hearing protection while using a concrete saw, but you need to be aware of the sound or feel of blade speed, because concrete saws are sharply affected by side resistance that slows the blade down. And you can't apply pressure to force the blade through the concrete -- it's all about blade speed. So keep a straight line to reduce side resistance, and be sensitive to keeping blade-speed RPMs high. It may seem obvious, but it's still worth noting: Unless you have equipment like a Dingo, you'll be lifting away whatever size pieces of concrete that you cut. You can see the size of the surface, but not the depth of the concrete you're cutting. Concrete saws are great for making cuts that prevent cracks from extending across slabs you want intact; and in doing precise cuts, like cutting gaps for pipes or conduit. But for a lot of DIYers, concrete saws can be a lifesaver in terms in making the process of demolition go a lot easier. If you're taking a look a a demolition project that involves renting a jackhammer -- like breaking up a slab, driveway, or foundation, tag-team the job with a concrete saw. It will go a lot easier!